Shop online for 163 slot cars at discounts up to 70%. HO Slotcars is the most popular of the 4 slot cars categories, then 1/32 Slot Cars, and 1/24 Slot Cars. 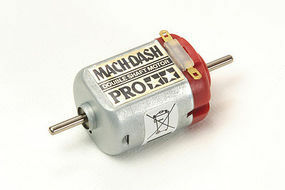 AFX is ranked #1 out of 7 slot cars manufacturers, followed by Innovative Hobby Supply, and Round2. 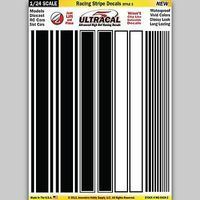 This is the 1/24 UltraCal Hi-Def Peel & Stick Decals- Racing Stripe Black/White Style 3 Slot Car Decal by Innovative Hobby Supply. These are 15" Straight Track for use with the AFX Racing Series. Recommended for ages 8 and up. 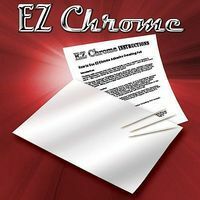 This is the EZ Chrome Finishing Adhesive Backed Foil (6x10) Slot Car Part by Innovative Hobby Supply. This is the Mega-G Tune-Up Kit by AFX. Suitable for Ages 8 & Up. These are two sections of AFX 18" Radius Curve Slot Car Track. Suitable for Ages 8 & Up. 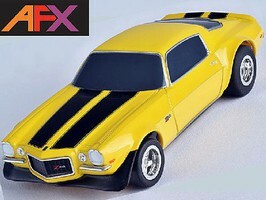 This is the Mega G+ Yellow Camaro Z28 HO Scale Slot Car from AFX Collector Series. This is the SRT Tune-Up Kit by AFX For ages 8 years and up. This is the 1/32 UltraCal Hi-Def Decals- Vintage Racing Names & Numbers Slot Car Decal by Innovative Hobby Supply. Banked Curve Track is designed to be used with the AFX racing series. Suitable for Ages 8 & Up. This is the HO Scale Mega-G Audi R10 Test Black Slot Car by AFX. Suitable for Ages 8 & Up. This is the 1/32 Jel Claws Rubber Racing Tires for SCX Nascar (2)(Front/Rear) Slot Car Part by Innovative Hobby Supply. 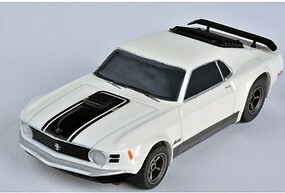 This is the Mega G+ Orange Mustang Boss 429 HO Scale Slot Car from AFX Collector Series. This is the AFX Slot Car 25 Pack Track Clips from Tomy. Suitable for Ages 8 & Older. 12" Curved track is designed to be used with the AFX racing series. recommended for ages 8 and up. This is the 1/24 UltraCal Hi-Def Peel & Stick Decals- Stock Car Racing Number Yellow/Black/Red/ Slot Car Decal by Innovative Hobby Supply.